“I welcome you to this meeting to review the situation in the States most affected by Left Wing Extremism. I am grateful to the Prime Minister for agreeing to chair this meeting. During the period January to June, 2010, there have been 1103 incidents of violence perpetrated by Left Wing Extremists. While 97 extremists were killed and 1,341 apprehended, 209 members of the security forces also lost their lives. These figures underscore the gravity of the challenge posed by Left Wing Extremism. You are aware that the CPI (Maoist) is the principal Left Wing Extremist organisation. As long as the CPI (Maoist) was not challenged effectively, it expanded its area of activity, recruited more cadres, kidnapped more persons, extorted more money, acquired or looted more weapons, asserted its dominance in more areas, and targeted the security forces as well as civilians. Among the civilians, the CPI (Maoist) specially targeted civilians who it named as ‘police informers’. Between 2004 and 2008, on an average, 500 civilians were killed every year and many of them were killed after being named ‘police informers’. In 2009, 591 civilians were killed, of which 211 were named as ‘police informers’. This trend has continued in the first half of 2010 too, with 325 civilians killed, of which 142 were named as ‘police informers’. We are especially concerned that ordinary citizens should be labelled as ‘police informers’ and killed by the CPI (Maoist). The CPI (Maoist) has no right to set itself up as judge, jury and executioner. In fact, it has no right to carry arms. It is a banned organisation and functions outside the pale of the law. The State Governments and the Central Government cannot ignore these self-evident facts. Since the first meeting of Chief Ministers on Internal Security held on January 6, 2009, we have agreed upon a two pronged strategy, namely, development and police action. Since then we have remained on course and, in subsequent meetings at New Delhi and in the State capitals, we fine-tuned the strategy in accordance with State-specific requirements. The efforts of the State Governments, assisted by Central Para-Military Forces, have met with mixed results. Key leaders of the CPI (Maoist) have been apprehended. Many attacks were repulsed. Security forces have asserted their control over some areas in the districts of Gadchiroli and Kanker. However, there have been setbacks too. The most serious setbacks were in Silda (West Bengal) and in Tarmetla, Chingawaram and Dhaudhai (all in Chhattisgarh). Besides, there was the derailment of the Gnaneswari Express that claimed the lives of 149 innocent civilians. 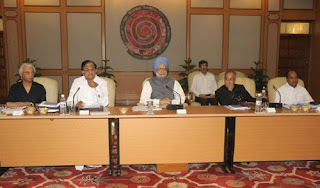 While there have been some lapses on the part of the security forces in failing to follow standard operating procedure, there can be no gainsaying that the attacks by the CPI (Maoist) were pre-meditated and carried out with the object of inflicting maximum damage on the security forces and overawing the people and the elected governments. We would do well to remember that the attacks by the CPI (Maoist), whether opportunistic or pre-planned, are part of their strategy of ‘armed liberation struggle’ and in furtherance of their goal of ‘seizure of political power through protracted people’s war’. (vii) To improve road connectivity in 34 districts most affected by Left Wing Extremism. A number of roads and bridges are proposed to be included, at a cost of Rs.950 crore, by the Ministry of Road Transport and Highways under RRP-I. (viii) The Planning Commission is considering a Special Development Plan for the affected districts/States with emphasis on road connectivity, primary education, primary health care and drinking water. Consultations have been held with the State Governments and it is expected that the Plan will be placed before the competent authority, shortly, for approval. In the course of your interventions, I would request each one of you – the Governor and the Chief Ministers – to give your views on the measures that I have outlined above. I would also request you to tell us what more measures are required to be taken to curb the menace of Left Wing Extremism. I hope that each one of you will bring to the table the things that we are doing right and the things that we are doing wrong and that we can have a free and frank discussion on this very serious subject. With these words I welcome you once again to this meeting. I shall now request the Hon’ble Prime Minister to kindly chair the meeting and guide our deliberations.